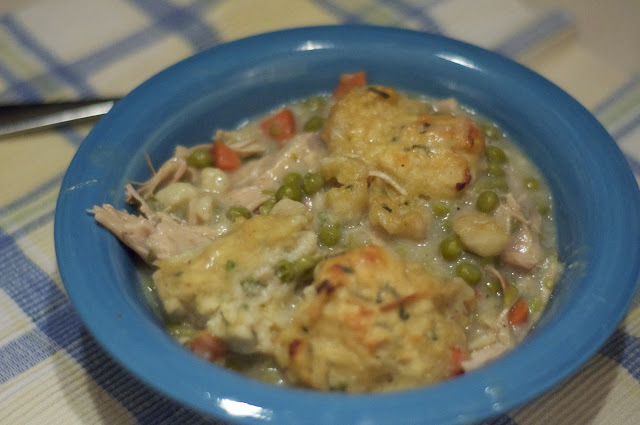 Lorrie's Story: Yummy Chicken and Dumplings!!! To make chicken: Place chicken and all ingredients into a slow cooker and cover with water. Set on low (according to manufacturer's instructions), and cook until chicken is falling apart. When done, remove the chicken. Strain the stock and shred the meat into big pieces. To make vegetables: Slice vegetables up into a julienne, and set a large sauté pan over high heat. Add a 2-count of olive oil, and sauté vegetables until translucent. Fold vegetables into the slow cooker with the stock. Fold the shredded chicken back into the mixture and season well. Add chopped fresh parsley and stir. Turn slow cooker up to high while you make the dumplings.